For confined, narrow applications, reach for DMT® Diafold® Flat File. 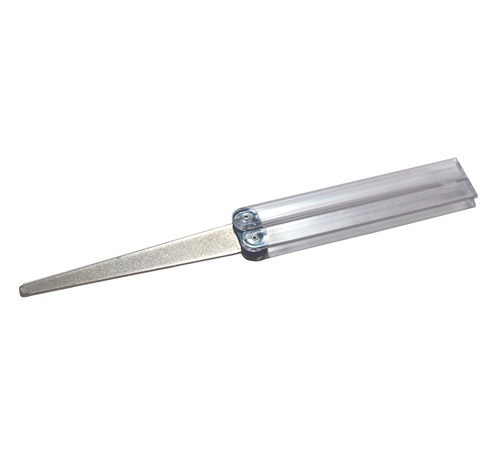 Only 1/16" thick, diamond surface on one side, tapers from the base 3/4" to 1/4". Convenient size measures 9 1/2" long when open and 5" closed. Folding plastic handles protect file when not in use. Hones in a fraction of the time required by conventional files. No messy oils needed -- use dry or with water. Durable construction will provide years of consistent performance and reliable service. Coarse diamond (45 micron/ 325 mesh) to quickly restore a neglected edge. Extra coarse diamond (60 micron /220 mesh) to fix and restore a damaged edge.